Today, April 10, is National Siblings Day, honoring the relationships of siblings. This day is of particular importance to Imagine!, as siblings often play incredibly important roles in the lives of the people we serve. You will find Imagine! siblings among our staff members, on the Imagine! Board of Directors and the Imagine! Foundation Board of Directors, and of course advocating for their brothers and sisters at Imagine! every day. 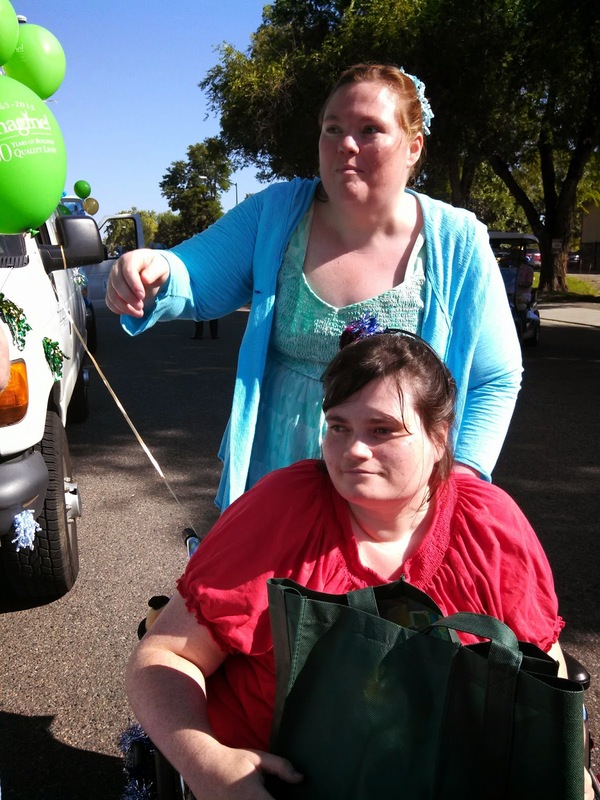 To recognize National Siblings Day, Lou Ella Price, who works for Imagine!’s Innovations department, wrote the essay below about her unique experience as a sibling of a woman with intellectual disabilities. Lou Ella’s words are touching and inspiring, and I am pleased to share it with you today. Over the past year I have been fortunate to work with several advocacy efforts to support siblings of individuals in our community. Siblings are such an integral part of a person’s life who experiences a disability. Whether older or younger, they are at times the silent strength, fun, diversion, and driving force for their disabled brother or sister. They help leave the wheelchair skid marks on the wall, instigate a water fight that ends in rolling on the floor in laughter, and spend the day drawing funny faces to bring out the smiles when all there are is tears. What can be said about siblings is that they are an amazing support system that sometimes works so well that they blend into the background when so much is going on. When my sister was diagnosed with developmental disabilities, we lived in an area that did not provide much support for families, let alone siblings. It was often a struggle just to find a doctor who understood my sister and what her needs were, and often the needs of the family were not even a part of the equation. I remember sitting in doctor’s offices while my mother talked with the doctors and feeling as if I had become invisible in the process, yet knowing that any decision made would impact my life as much as my sister’s life. The next surgery, therapy, or treatment gave me the same fears and doubts as my mom and sister. I sat in every waiting room along with my mom and sister, visited every specialist, made every trip to the emergency room, and fought every struggle with my sister. There is a certain sense of powerlessness that siblings can feel because they are, at times, not included in the processes, and understanding the processes is very key to siblings later becoming advocates and guardians for their siblings. As parents become older, siblings can be that natural source of support, guidance, and care that is critical for continuity of care. However, many siblings that I have had the honor of meeting in the last year have expressed not feeling prepared or feeling lost in the process which has left them feeling alone yet again. So, in honor of April 10th being the National Siblings Appreciation Day, I encourage everyone to reach out to the siblings of the families you support regardless of their age or level of involvement and thank them. Thank them for being that amazing support system that blends into the background, thank them for caring, and thank them for being involved. Also, let them know that there are resources and support systems out there for them. Siblings of individuals with disabilities should never feel alone, and they should celebrate their uniqueness. And in honor of all of the siblings who work within the Imagine! network, thank you!